Kent chose the name of the band with great intention. 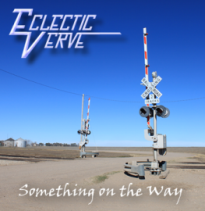 “Eclectic Verve” is a clever way of not categorizing their music into just one genre. Just as Kent’s musical influences have been varied, his topical inspirations have come from his life experiences. Read the band’s blog to learn more about Kent’s music inspirations. When the couple does categorize their music by genre, they typically say, “Pop / Rock / Alternative Rock.” However, Kent has also delved into some country tunes and the second album for Eclectic Verve is a collection of children’s songs. On the couple’s debut album, Something on the Way, the music integrates a variety of styles. The music brings to mind artists such as R.E.M., Collective Soul, and even hints of John Denver in the vocals. In “Am I Crazy?”, “California Shakedown”, and “Signs” you can hear some of Kent’s guitar influences such as The Edge of U2, Andy Summers of The Police, and Stuart Adamson of Big Country from the ‘80s. The guitar style of Alex Lifeson of Rush influenced “This is the Time”, “We are the Watchdogs”, and “California Shakedown”. Kent’s years of playing Stevie Ray Vaughan and blues tunes are apparent in several guitar solo structures and a few riffs that sneak out on the tail end of “Going to Colorado” and “Cobalt Sky”. 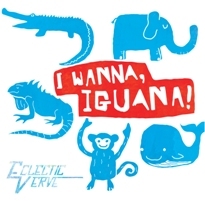 The playful nature of the second CD, I Wanna, Iguana!, allowed Kent to delve into a few genres that may not typically show up on an Eclectic Verve album and to do so in a fun way. Reggae is a fun genre and being able to write and play steel drum melodies as well as having monkeys sing the chorus on “Monkey Talk” was as enjoyable as listening to them! The “Goodbye Song” has a twang to the guitars with an almost rock-a-billy beat. The call and answer feel, the alternating harmonies, and the vocal register of Kent’s voice in the “Goodbye Song”demonstrates another of Kent’s music influences, the B-52’s, who are no strangers to fun, quirky songs. Throw together some Jazz, a little R&B (Rhythm and Blues), overlay it on a standard 12-bar blues progression, and shake it all together and you get “Shake the Dirt Off”, a tribute to children’s abilities to move and have fun with everyday tasks. Stevie Ray Vaughan makes a return to Kent’s songwriting with his influence on the guitar solo. The funky feel of “Shake the Dirt Off” in general reminded our engineer of Phish. The bridge to this song lends itself to the CD title with it’s theme of “if you wanna, iguana, go ahead and do it!” “Indigo” returns the listener to a straight-up classic rock foundation almost on the verge of AC/DC until the vocals come in and drape the song with a rhythmic, almost rap feel to the verses and a jazzy feel on the pre-chorus. The blip-drop synthesizer on the chorus adds a playful element reminiscent of ’80’s electronic pop. The easy, care-free, flowing groove of “Maitland’s Meadow” pays homage to a Moody Blues type of sound on the verses with a driving chorus as the narrator describes her natural meadow playground. Eclectic Verve’s second album concludes with a lullaby, “Wiegenlied”, complete with a string arrangement and angelic echoes. The doubling effect on the acoustic guitar was inspired by another of Kent’s classic rock influences, Pink Floyd.